- Always wear personal flotation devices, they float, you don’t. And it won't work if you're not wearing it. - Mixing alcohol and canoeing is far more dangerous than most people realize. 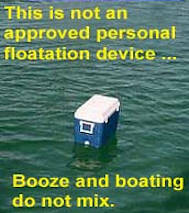 Don't booze and boat. - Always wear protective footware. - Never stand up in the canoe or kayak unless coming on shore. - If you fall overboard, stay with your boat it can give you something to hold on to until you can get to shore. - Don't overload your canoe, never paddle alone, and always pay attention to the river conditions. All guests are required to read and sign a release of liability; and agree to wear life jacket at all times, agree to not have have alcohol in shuttle vans, trailers, bus, or any rental equipment, to return all rented equipment by 6:30 pm, and agree to pay for repair or replacement of equipment due to abuse or abnormal damage. We have the right to refuse rental if you are in an altered state due to alcohol or drugs.